To stabilise our climate, zero emissions of GHG are required eventually, and adaptation to the social changes along with this seems to be inevitable. So it is not only a matter of energy supply system but we need structural changes and a revolution in the existing socio-economic system as a whole. We are in a period of huge transition in our modern history. To accelerate a transition, more comprehensive approaches including dematerialisation, enhancement of city Initiatives, reform of energy market with competition and cooperation, as well as up-scaling private investment to low-carbon/green economy. Some emerging issues are, for instance, the evaluation of the long- term pros and cons of introducing shale gas, and how to leverage green investment to realise a new economic regime for a low-carbon society. This side-event aims to share knowledge and key findings of the outcomes of the International Research Network for Low Carbon Societies (LCS-RNet), consisting of researchers and experts working on the front line of governmental policy-making processes. 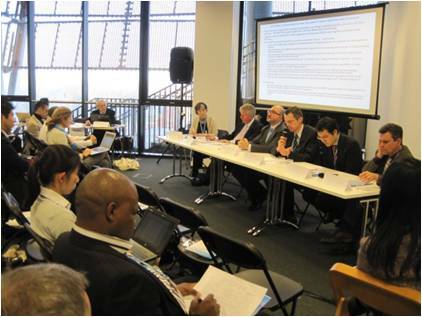 At the beginning of the side-event, Mr. Junichi Shiraishi, Ministry of the Environment, Japan gave his opening remarks, in which he expressed his expectations for LCS-RNet activities, reflecting the latest scientific findings into policies in an effective manner. He also stressed that the Ministry of the Environment must consider not just mitigation aspects, but also adaptation, on the road towards creating low-carbon societies. The key messages of LCS-RNet Fifth Annual Meeting were given by Dr. Mikiko Kainuma of NIES and Dr. Sergio La Motta of ENEA, Italy, who stated that the world is entering a huge transition phase historically, and in order for society to break free from and avoid having further lock-in to energy-intensive alternatives, it will be imperative to collect and then mobilise global wisdom. They also stressed that a substantial portion of future emission reductions worldwide must be made in developing countries, so in this context, the activities of this network should be expanded as a means to discuss low-carbon development in both developed and developing countries. In addition, Dr. Jean-Charles Hourcade of CIRED, France, expressed his views that a low-carbon society and green economy can be considered as two kinds of effective leverage that have the potential to induce wider transitions towards a sustainable world. Next came reports on efforts made by various countries towards achieving low-carbon transition. Mr. David Warrilow began introduced the UK, a country that has mentioned transition for low-carbon societies in its Climate Change Act 2008. In this act, the net UK carbon account for the year 2050 was set at 80% below 1990 levels. The UK has also developed a “Carbon Budget” for four terms, every 5 years from 2008 to 2027. Dr. Antonio Navarra of CMCC/FEEM, Italy, stated that transition to low-carbon societies is accompanied with a major transformation of social structure, and it is difficult to understand this transformation under the context of the current, on-going university system. Therefore, a more interdisciplinary approach is necessary. Dr. Axel Michaelowa from Switzerland emphasised that a co-benefit approach has limitations in evoking such a large transformation in social and energy structures for low-carbon societies, and, it is certainly a challenge for us to build-up long-term low-carbon societies under political change such as regime change. Dr. Junichi Fujino of NIES mentioned about “eye-opening” efforts made by developing countries in Asia and these rapid diffusions. He introduced an example in Iskandar, Malaysia, where a low-carbon blueprint has been developed over the last few years, and .stated that we should pay much more attention to such examples of “leapfrogging”. For the Q and A session, there was a question on what would be triggers leading to low-carbon development and low-carbon societies. Mr. David Warrilow replied that the UK has put immense credibility on science, and he added that energy security ensures the diversification of energy sources. Dr. Junichi Fujino stated that Iskandar, Malaysia, focuses on quite a few factors such as setting up emissions reduction target in national level, and looking at leadership both at the national and local (municipal) level. Iskandar also emphasises opportunities as a special economic zone, its geographical features as a neighbour to Singapore, and also the partnerships and close ties between local universities and research collaborators. – How should we deal with mitigation and adaptation in an integrated manner, from a global risk management aspect? – What roles is played by low-carbon and resilient investment, through green technology, technology innovation and finance, and can they serve as leverage to recover from the economic crisis? – How should we strengthen climate policies in response to increasing new sources of cheap energy, such as shale gas? – How should we approach electricity system reform as a common carrier of various types of new energy and demand-side controller? – Cities are good units to lead the transition. How should we promote a bottom-up approach by cities? – How can we support and convey our experiences to emerging economies, especially in Asia, towards low-carbon, resilient development? – How can we create resource efficiency improvements which can contribute to reducing energy on the demand side and reflect them into policies? The side-event pointed out that agendas should be identified following thorough discussion amongst those concerned.